Last week I wrote about some of my thoughts about keynote talks at major conferences. It was pretty well received, and elicited some interesting comments from people I respect in the education world. I also posted a less than interesting video that I created for the post. Don’t go watch it, it really isn’t that intriguing, despite my attempt to spin it as such in the original post. HELP! I've lost my iPad! Anyone at #macul14 seen a light blue one covered with stickers? Please RT! Do you see the love in that tweet? It’s right down there in the corner; 66 retweets. Sure, there are plenty of people that amplified my call for help because I know them, and we connect often enough on Twitter that I can call them friends. But many of those retweets were born out of the sense of community that was (and is) the #macul14 hashtag; individuals that I’ve never met, and may never have a chance to become acquainted with. It’s a small example of the power of Twitter, but it was a powerful one, and I’m grateful that it’s become an important part of how I connect with others in my personal and professional life. People started to ping me every few minutes to check in on me and my lost iPad. Friends who knew how miserable I was feeling at the potential loss of the device, acquaintances that I have only met once or twice at other conferences and weren’t even in attendance at MACUL 2014, and concerned colleagues all checked in on my throughout the day. I felt loved….well, as much as anyone can feel loved through 140 characters. And yes, I found my iPad. Some kind soul had moved it off to the side of the table where it had been placed, and I missed it the first time I went to check for it. After nearly 6 hours of taking time lapse photos, and a dead battery, it had just shy of 4,000 photos from the conference on it. Oi! 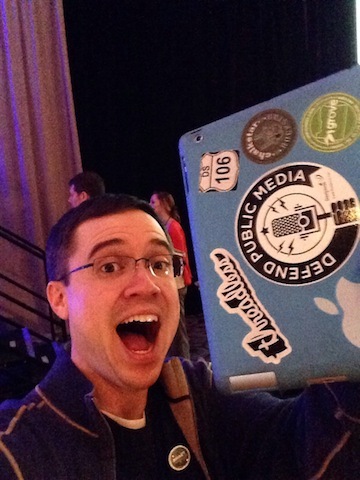 Next:14 Days of #macul14 – Day Seven – ALL of the MACUL Interwebs! Is the perspective funny in that picture or do you have a giant iPad?